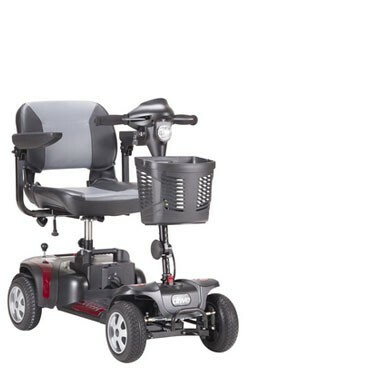 If you're seeking an easy, transportable mobility option that's ideal for outdoor use, but need a weight capacity greater than 300 pounds, the Drive Medical Phoenix HD 4 is perfect for you. The Phoenix HD 4 has the highest weight capacity in the market for travel scooters and combines easy portability with a 350 lb. weight capacity to accommodate a greater variety of users. Two 20 AH batteries are included for a great driving range. The Phoenix HD 4 is lightweight and easy to disassemble—perfect for taking wherever you want to go, either around the neighborhood or far from home. The scooter can be disassembled quickly and easily into four easy-to-handle pieces for loading into a car, truck or van to take shopping or on vacation. The Phoenix HD 4 offers great features which include color change panels in red and blue and ergonomic —finger-pull" throttle control to make operating the scooter easier if you experience limited strength or dexterity in your hands. The Phoenix HD 4 also includes a headlight for enhanced safety and solid, flat-free tires for worry-free use. You can adjust the height of the Phoenix HD's comfortable stadium-style seat which has attractive two-tone upholstery and armrests that can be adjusted in width and angle. The Phoenix HD also provides top performance with its 4 mph top speed and 15 mile maximum cruising range. Cons:Sit is not straight. The rod from the bottom has a pin the holes are not lined up right. Very good product. Gave me some freedom back. Easy for family to load. Battery last long time. Comfortable seat. Cons:Turn radius could be better. Wish it had drink holder. Very nice to ride and easy to control. Easy to put together out of the box. I bought this after months of seeing my once very active father struggle with walking. He absolutely loves it! He is no longer stuck in an immobile chair. It was super easy for him to use. I bought it for when he travels as our family loves outdoor activities. He can now keep up with his great grandchildren, follow us on walks, and safely drive on his own. Pros:It has good ground clearance for a slightly rugged path such as light gravel but I wouldn't recommend anything too rugged. It's best to use on firm packed ground if not using on a paved area. The speed goes up to a slight jog for myself and slows enough to easily navigate in a light crowd. It turns corners safely and easily. It is light enough when disassembled to pack into the trunk. It even fits in the trunk of my Toyota Corolla. It's very easy to assemble. Cons:Although it's a good size for my 5'7 father, it may be a little small for someone much taller. However, that would take away from the convenience of a lighter more compact scooter and it would be harder to make turns. I adjusted the seat higher and when my dad wants to stretch his legs he can rest them above the covered front tires that has protection for just that purpose. So, there is really nothing that we don't like about this scooter. Why did I wait so long? Foolish vanity.